The real test of any SAM system goes beyond creating a one-time Effective Licensing Position (ELP) for a given software publisher. To be truly valuable, the SAM solution has to have the ability to manage change. Being able to work from a dependable list of software that has been approved by, and which also serves the business, means that finite IT & SAM resources are not wasted through the support of legacy software that might be deemed redundant, and should keep a company on track technically by not becoming dependent on aging software. 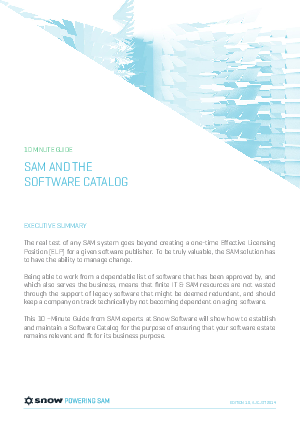 This 10 –Minute Guide from SAM experts at Snow Software will show how to establish and maintain a Software Catalog for the purpose of ensuring that your software estate remains relevant and fit for its business purpose.